Although the economy has gotten better over the past 8 years, since the historic collapse of the stock market in 2009, which sparked the Great Recession, people still have a great deal of economic anxiety. On the whole, people’s confidence in the economy is relatively low, despite over 75 months of straight job growth. The reason for this is due to the fact that wage rates have done little to keep up with the rate of inflation, generally. Regardless, the only thing a lot of people can do is make sure that their financial future is secure. It’s hard to imagine that living too long would be such a major problem. However, it has caused an issue for many people who planned their retirement funds for a different expectation of longevity, when the average lifespan was shorter. This is especially a problem for Social Security, where the rising longevity of many citizens has caused more people to be withdrawing from the fund than ever before. There are two ways to address this problem. The first is to plan for the best, in terms of your life longevity. Your expenses should be planned out well beyond you expect to live, in terms of collected capital. On top of that, it is very wise to set up low-risk investment accounts that can supply a livable wage, year after year, without decreasing the total amount. It is undeniable that the market has changed, drastically. If you were to time travel from 1995 to now, then the skills that you have would probably be horribly unfit for the modern job landscape. This is one major factor that is causing many facets of the population to struggle, in terms of job and wage growth. It has even caused many companies to collapse, as they have been afraid to change with the times. The truth is that the jobs that will populate tomorrow’s market are going to require an incredibly different skillset. If you want to protect your financial future, it is important to never stop learning, and always strive to adapt with the market. Try to keep educated on new skills that will be useful, and your employability will remain safe. The amount of capital that is required to sustain a person can change, drastically, depending on that person’s choices. 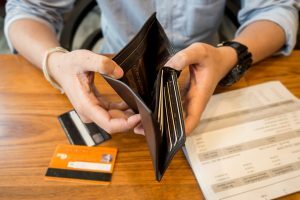 One common reason of bankruptcy (not the most common, though) is that people will grow their lifestyle beyond their means, without preparing a contingency for the future. However, there are no shortage of life-changing mistakes that can destroy your financial future. Some of this are more severe than others. For example, addiction can horribly affect an individual’s finances (among other aspects of their life), and it can be hard to recover, financially, from addiction. Bankruptcy can also be connected to major business failures, divorce, and mental illnesses. Electronic payment systems have made the world much, much more convenient for millions and millions of people. However, with the rise of the internet and these electronic payment systems, so too has the growth of identity theft continued to climb. Based on FBI statistics, identity theft is one of the fastest growing crimes in the United States. Identity theft can ruin your credit, and can allow a person to blow through portions of your capital and savings. Because of this dangerous fact, it is important to talk to your banker or financial advisor about how you can take steps to prevent identity theft in your life. While you certainly can’t predict every curveball that life throws at you, you can certainly set up contingencies to make sure that you and your family’s financial future is protected. In today’s world, this is simply called insurance. Take the time to sit down and really consider the many ways that an accident, unexpected illness, or sudden shift in the economy could impact your life, and make sure that your insurance will adequately cover you when you need it most. After all, it pays to be prepared. This article is written By Alek S.
Does It Make Sense To Pay For ID Theft Protection?